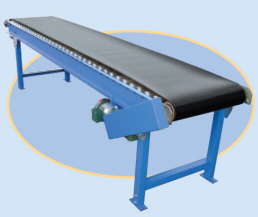 This horizontal belt over roller conveyor has been designed to move products and materials from one department to the other. Each roller helps minimize belt friction, thus providing for greater capacities. RB SERIES SPECIFICATIONS: 1/2 HP 220/3/60 Motor ▪ 1.9” 16 Ga. Rollers on 3” to 6” Centers ▪ 5-1/2” 10 Ga. Channel ▪ PVC Belt ▪ 60 FPM ▪ 4” Drive Pulley ▪ Capacity: 1000 lbs.